Shawls aren’t just for old ladies anymore! This pattern is for a shawl that definitely warms up a brisk fall walk or a chilly winter morning, but can also be worn as a cowl (flipped around backwards and tied behind head, as pictured in the second photo). In this pattern you use two strands of DK weight yarn held together throughout, but if you wanted a lighter version you could use one strand of yarn and the same N hook. approx. 738 yards, 11 oz. Finish off. Weave in any ends, make it pretty! 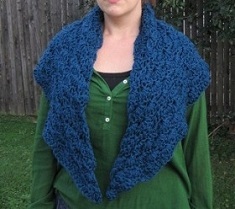 This entry was posted on Monday, September 13th, 2010 at 12:00 AM by Erin Burger	and is filed under Free Crochet Patterns. You can follow any responses to this entry through the RSS 2.0 feed. You can leave a response, or trackback from your own site. Thanks Rachel for all of your advice and beautiful patterns! We are lucky to have you, and you are an inspiration. Great pattern, I will give this a try. I will have to try this one. I have tons of yarn I could use. I would need one on a day like today. It´s a bit chilly over here. Even in Mexico! 🙂 Thanks, Erin! another project to add to my “to-do” list. Love all of your patterns! I am only getting 21 dc and 4sc when I do this using the 23 stitches from the prevoius row meaning I only have 25 stitches to start row 5 with. 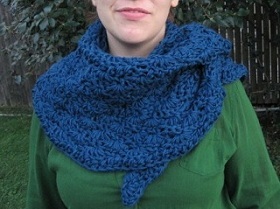 Do I need to crochet into the top of the turning chain to make 26 stiches? There are only 4 sc in that row. Thanks for bringing it to my attention, I’ll correct the pattern. Thanks for correcting row 4 but the correction means the stitch count is wrong for the rest of the pattern too! What does DK stand for when talking about the yarn? Can this be made longer to cover more of the arms. Gets cold for some of the gals at church. we have adopted an area that needs help. I am having a little difficulty with this pattern, I am hoping you can help. My question is in row 8. After the *, it says skip 2 DC, then 5 DC in the next DC. Should that be 5 DC in the next sc? Hi Annie, yes I think Erin meant to write 5 dc in next sc. Thanks for catching that! charity group. So nice to have a new fresh pattern to work on.